SEATTLE, May 15, 2018 /PRNewswire/ -- Nordstrom, Inc. (NYSE: JWN) announced its extended sizing expansion to 30 stores, with 100 brands producing extended sizes – by adding more zeros, 2's, 14's, 16's and 18's - across multiple categories, including denim, dresses, swimwear, activewear and lingerie. New signage highlights the extended sizes in the participating stores. The retailer aims to make the shopping experience inclusive for everybody – and every body, both online and in stores. The initiative launched at Nordstrom Century City in Los Angeles in October 2017, with participation primarily coming from denim brands including Topshop, Rag & Bone and Madewell. For holiday 2017, Nordstrom launched the initiative online with 40 brands making extended sizes. At that time, the retailer set a goal of expanding extended sizes to 15 additional stores with 60 participating brands by the spring of 2018, and is excited to have exceeded those numbers. It's important to note that Nordstrom is not eliminating its existing plus size or petite departments, but instead is working toward filling the gaps in sizes and integrating all sizes together for a more size inclusive shopping experience. ***More brands are available upon request. 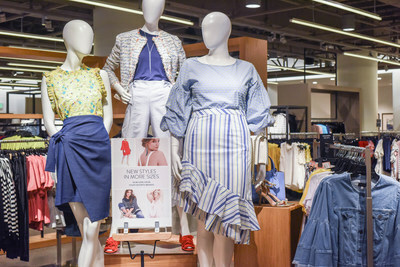 "The industry really needed a retailer to be the voice of customers and ask for more sizes," said Tricia Smith, Nordstrom executive vice president and general merchandise manager for women's apparel. "It's been hard work and we're making progress. We're thrilled more and more brands are extending their offerings to this population of stylish women who were previously missed. We remain focused, inspired and committed to inclusivity and having more sizes available to serve customers." Smith elaborates further that, "Style and fashion apply to everyone. We don't view being size inclusive any differently that the need to be more inclusive across the board—whether it's ethnicity, size or body type. In our opinion, petite and plus sizes shouldn't be considered special categories. They're just sizes." Nordstrom is further expanding the extended sizes initiative for the upcoming Anniversary Sale (beginning July 20,) with many of its own private label brands making up to size 24. For fall 2018, a broader range of size-inclusive mannequins designed exclusively for Nordstrom will be rolled out in the 30 stores to help create a size inclusive shopping experience. The retailer will also be working on expanding the range of sizes available from its European brand partners. Nordstrom, Inc. is a leading fashion retailer based in the U.S. Founded in 1901 as a shoe store in Seattle, today Nordstrom operates 370 stores in 40 states, including 122 full-line stores in the United States, Canada and Puerto Rico; 236 Nordstrom Rack stores; two Jeffrey boutiques; two clearance stores; seven Trunk Club clubhouses; and its Nordstrom Local service concept. Additionally, customers are served online through Nordstrom.com, Nordstromrack.com, HauteLook and TrunkClub.com. Nordstrom, Inc.'s common stock is publicly traded on the NYSE under the symbol JWN.